I have been studying your writings on extending the WebBrowser control, and verified that the extended web code you wrote for C# compiles and works fine in VS 2010 beta, against FrameWork 4.0. Many thanks for the valuble code and writing ! I am "stuck" on how to read the contents of an IE browser page when the page is displaying a local file, like the contents of the Favorites folder. All my attempts to get at the Document or DomDocument by casting it to the usual mshtml.dll interfaces fail. I am NOT asking you to answer my question, or respond, but if you ever get interested in blogging about this aspect of use of IE, I think many people would be interested. I have done a lot of research on the net, and posted my own question on StackOverFlow : so far not one real pointer, and, possibly, this is not "doable" (?) : maybe what you are seeing when IE shows a file contents is a kind of "virtual explorer" view that is not parseable. And I decided to take at look at it to see if I could be of any help and I found out that it is easy and doable. So I find an useful link by Andreas M. if you want to look at it. In general My Favorites, Desktop, etc are special folder. So they need a trick to be able to access them. 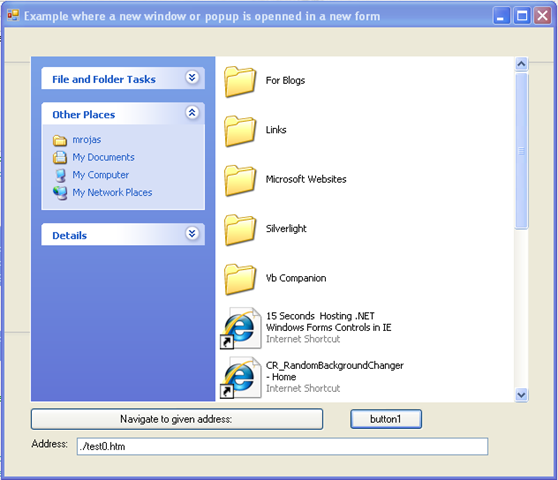 /// Returns the shell folderview object displayed in the webbrowser control.